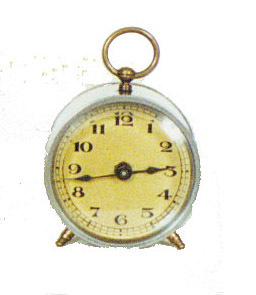 Ansonia Clock Co. novelty clock, "Bee", ca 1908. 8 day time only, running. Takes a male key to wind in the back. 3 inch nickel case in very nice condition. Beveled glass, metal dial. Ly-Ansonia No.2292.